Puna Rock Company provides services to complement their product offerings. 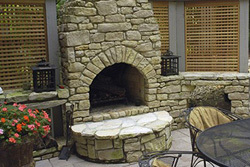 Our experienced staff of landscapers will deliver your rock products to your door. Whether you want to install them yourself or have our team complete the work, we will schedule a convenient delivery and help you unload large or small products. We are always on time and call to confirm your appointment time. If you need to reschedule, that is not a problem; we will work with you. We do offer several size trucks; our smaller truck with a max load of 5-6 tons cinders and lighter products with a max load of 4 tons, our tandems with a max load of 20 tons and lighter products at 15 tons. And our Super Dumps that can carry 25 tons. Prices vary by truck and distance so customers would need to talk to a scale house attendant in order to get an estimated quote on price. *Lighter loads meaning the volume to weight ratio before the truck is filled. Puna Rock Company can offer a free estimate of time and cost on any work you would like done on your property. We can make additions and adjustments to fit your schedule, budget, and architectural style.